To say that Mangalampalli Balamurali Krishna was a legend in his lifetime would be an understatement. His greatness extends far beyond the confines of his lifetime and also beyond the boundaries of the music world. He was a glorious example of greatness as it were. I, for one, belong to the vast mass of people whose knowledge of music is limited to appreciating film songs and little else. For me, classical music used to be very tiring to listen to, much less a thing to understand and appreciate. In the routine course, I used to watch, now and then, Balamurali sing on Television, and that became a catalyst for developing a liking for Carnatic music in my later years. His voice has a magical quality that mesmerizes even musically deaf people like me. It is as though, it is specially fine-tuned for music, right from his childhood. While the voice may be a god-given gift, his outstanding musical accomplishments are all of his own effort and his own creative genius. Carnatic music has the unique legacy of being born in Telugu language but the musicians were (and are) – especially in later years – predominantly Tamilians. One is reminded of Buddhism which was born in India, but flourished only in other parts of the world! 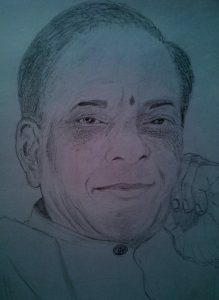 In his formative years, Balamurali might have faced a hostile environment in which all the citadels of Carnatic music were monopolized by Tamilians and there was hardly any Telugu musician of comparable stature to seek inspiration from. It goes to the credit and catholicity of the young Balamurali that he turned this adversity to his advantage, by adapting himself to the Tamil-speaking musical world of Madras without any parochial or linguistic narrow-mindedness. For him, music was the only language and pursuit of music his only mission in life. And that mission he fulfilled par excellence and, in the process, made both Telugus and Tamilians proud! Hats off to the magnanimity of the Tamil music world for nurturing a non-Tamil musician in their fold, and the dormant Telugu music world was brought back to life in the vibrant presence of Balamurali on the musical firmament. Balamurali has restored the pride of Telugus in the sphere of Carnatic music as no other contemporary musician could. That said, let me also confess that talking in such terms as ‘Telugus’ and ‘Tamilians’ would be antithetical to Balamurali’s stature; his greatness transcends all these ‘narrow domestic walls’. Balamurali is no more. But his voice, his music and his legacy are everlasting! Very nice publication. I have seen it for the first time. Keep it up!